Unlike the abovementioned cakes, khoai cake contains many ingredients and goes through totally different processing procedures. The main ingredient in the exterior is rice flour mixed with water and yolk and flavoured with cumin. 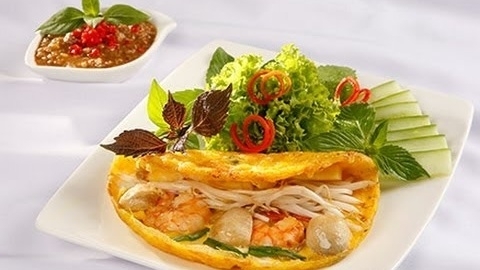 The mixed flour layer is fried until crispy around the edges, then filled with pepper, green onions, shelled shrimp, sliced broiled beef or pounded pork belly, fresh bean sprouts and field mushrooms. Next, it is folded in half to make it “smile.” After breaking off the cake with chopsticks and wrapping it in fresh mustard greens with aromatic herbs, sliced green banana and fig, the cake is dipped in a special sauce (called tuong) that is rather thick, salty and moderately sweet made from fine-ground rice flour, thick soya sauce, fried sesame, chopped pig liver, garlic and chili. Adding a little shrimp paste to the sauce is certain to make it more delicious. All the flavours seem to converge in a small piece of cake, harmonising with each other so perfectly that a single bite is worth a thousand words. All sorts of cakes can be found in other regions of Vietnam, but nowhere else can you savour the harmony of ingredients, the rustic simplicity of decorations and the tranquil ambience that belong only to Hue and its hospitable citizens.